Western region eMODIS Phenology Start of Season for 2001. The Remote Sensing Phenology (RSP) collection is a set of nine annual phenological metrics for the conterminous United States. Researchers at the U.S. Geological Survey (USGS) Earth Resources Observation and Science (EROS) Center utilize data gathered by satellite sensors to track seasonal changes in vegetation. The two satellite sensors that provide the raw data for the RSP program are the Advanced Very High Resolution Radiometer (AVHRR) from National Oceanic and Atmospheric Administration (NOAA) polar-orbiting satellites and the Moderate Resolution Imaging Spectroradiometer (MODIS) carried aboard National Aeronautics and Space Administration (NASA) Terra and Aqua satellites. The satellite data are initially transformed into Normalized Difference Vegetation Index (NDVI) values. AVHRR NDVI and eMODIS NDVI provide the foundation for RSP. Time-series NDVI can be summarized and analyzed to produce nine key phenological indicators that represent a complete growing season. These data represent a powerful tool for documenting plant life-cycle trends over time and detecting the impacts of climate change on ecosystems. Georeferenced Tagged Image File Format (GeoTIFF) is a TIFF file with embedded geographic information. This is a standard image format for GIS applications. Band Sequential (BSQ) image file is a binary raster format with an accompanying header file which describes the layout and formatting of the file. EarthExplorer offers a year-to-year record of AVHRR Phenology data at 1-km resolution dating back to 1989 and eMODIS Phenology data at 250-m resolution dating back to 2001. Nine annual historical Remote Sensing Phenology metrics for the conterminous United States are available for each data set. Amplitude AMP Maximum increase in canopy photosynthetic activity above the baseline (scaled NDVI). Duration DUR Length of photosynthetic activity (number of days). End of Season NDVI EOSN Level of photosynthetic activity at the end of measurable photosynthesis (NDVI value). End of Season Time EOST End of measurable photosynthesis in the vegetation canopy (day of year). Maximum NDVI MAXN Maximum level of photosynthetic activity in the canopy (NDVI value). Maximum Time MAXT Time of maximum photosynthesis in the canopy (day of year). Start of Season NDVI SOSN Level of photosynthetic activity at the beginning of measurable photosynthesis (NDVI value). Start of Season Time SOST Beginning of measurable photosynthesis in the vegetation canopy (day of year). Time-Integrated NDVI TIN Canopy photosynthetic activity across the entire growing season (interpolated NDVI). The download package for a given year includes a GeoTIFF or binary file for each of the nine metrics contained in a zip file. The actual start date and end date of source data along with a detailed description of each phenological indicator are available in the metadata provided with each download. Coverage Maps indicating the availability of eMODIS Phenology products are available for download. EarthExplorer can be used to search, preview, and download Phenology data. The AVHRR Phenology and eMODIS Phenology collections are located under the Vegetation Monitoring category. An annual record of nine historical Remote Sensing Phenology metrics for the conterminous United States is available at a resolution of 1 km for AVHRR phenology products (1989-present). Meier, G.A. 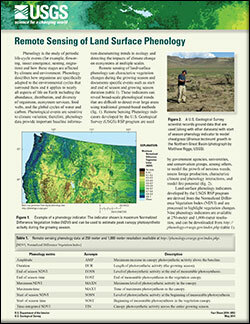 ; Brown, Jesslyn F.
Remote sensing of land surface phenology; 2014; FS; 2014-3052; Meier, G. A.; Brown, J. F.